The D.H. Lawrence Ranch, formerly called the Kiowa Ranch by the Lawrences, is located at San Cristobal, New Mexico, approximately 20 miles north of Taos and within the county of Taos. Situated on Lobo Mountain, it has an elevation of 8500 feet. It is currently owned and maintained by the University of New Mexico (UNM), having been deeded to the university in 1955 by Frieda Lawrence Ravagli. A five‑mile gravel road off State Highway 3 provides access to the 160-acre ranch. The proposed Lawrence Ranch District comprises approximately 10 percent of the whole (16 acres) and includes the caretaker's cabin/office (non-contributing), a cluster of six historical buildings (Lawrence Memorial, Lawrence Cabin, Brett’s Cabin, two barns and a cow shed), a corral/stable structure, four sites (“Lawrence Tree,” alfalfa field, ruins of a horno oven, and a spring), and two objects (Frieda’s headstone and Lawrence’s porch chair)—all contributing. These structures are all in fair condition with few modifications to the original cabins or to the district as a whole. (See Appendix A and Appendix B.) Surrounding this core are an additional 144 acres of relatively undeveloped forest land providing spectacular views of the desert and mountains--the Sangre de Cristo range on the east, the Jemez Mountains on the south, and the Colorado Rockies on the west. The property is bounded by the Carson National Forest and privately‑owned land in the San Cristobal foothills. The site is said to lie along an ancient route of the Kiowa Indians and was used by them as a camping spot. The ranch was first established by John and Louise Craig, who acquired title to this land in October of 1883, under the provisions of the Homestead Act of 1862. According to Lawrence's letter of August 31, 1924 (Letters 5:110‑11), John Craig was a squatter seeking gold. The Craigs staked a claim for water rights to El Rito de las Gallina in March of 1893, and it was subsequently granted. The headwater from the Gallina Creek is located on the north bank about a mile and a half from the ranch proper. Craig graded a path along a downward slope where he dug a ditch to conduct the water to his ranch for irrigation. He sold the ranch to William and Mary McClure later that year. During their possession, the McClures grew alfalfa on the open pasture (otherwise called the "alfalfa field") adjacent to the cabins and raised a flock of 500 white angora goats that roamed free in the mountains. During the ranch's history, most of the acreage has remained in its natural wilderness state. The "homesteader cabin" is thought to have been built by John Craig, while the construction of the other buildings may represent the combined work of Craig and his successor, William McClure. Mabel Dodge Sterne (later Luhan) purchased the property from the McClures in May of 1920 for $1500 as a gift for her only child, John Evans, who used it for hunting. He later, in 1922, returned the ranch (then called the Flying Heart), accepting a small sum of money and a buffalo‑hide overcoat in exchange (Lorenzo in Taos, 192). The ranch remained abandoned during this time; and, according to Lawrence, was allowed to "go to rack and ruin" (Letters 5:111). As an enticement to keep Lawrence in America, Mabel gave it to his wife, Frieda, in April of 1924. But the Lawrences felt they should give the original manuscript of Sons and Lovers as a return gift. (Mabel later claimed to use the manuscript in payment of a friend's psychiatric bill.) The Lawrences renamed the ranch first Lobo (Spanish for "wolf") and then Kiowa (for the Kiowa Indians). They initially camped at the ranch in the fall of 1922, when they thought of renting the cabins, and then took up residency there for five months in 1924 and for another five months in 1925 before returning to Europe. After Lawrence's death, Frieda lived at the ranch (during the 1930s) with Angelo Ravagli, the Lawrences' former landlord (at the Villa Bernarda near Spotorno, Italy), who had been a Captain in the Italian Army. The ranch became a site of aesthetic and literary pilgrimage after Frieda and Ravagli transferred Lawrence's remains to a hilltop shrine in 1935. Her stays at the ranch became periodic after having purchased a second home at a lower elevation for the severe winter months. The ranch cabins were then used as her summer‑house and as guest quarters for visitors. The ranch district under consideration, along with its resources, clearly exhibits the seven aspects of historical integrity: location, design, setting, materials, workmanship, aesthetic and historic feeling, and association with the D.H. Lawrences. An unpaved road still winds gently through desert‑mountain flora, including sagebrush, chamiso, greasewood, scrub‑oaks, cottonwoods, aspens, white firs, junipers, cedars, and piñon and ponderosa pines. Frieda remarked in 1939 that the stream of visitors‑‑"thousands of people"‑‑certainly "must want to come pretty badly" to take such a road, frequently impassable in heavy rains or snow (Memoirs and Correspondence, 273). Lawrence Ranch Road eventually opens out onto the cluster of rustic cabins with sloping pasture land in the foreground and tree‑covered hills in the background. The peaceful frontier ambience remains an integral part of the property's charm. As Frieda once said of the wilderness setting, it contains "something special" that "doesn't seem to change, as if nothing could tame it" (Memoirs and Correspondence, 379). None of the cabins has been moved from its original location with the exception that the two‑room "guest cabin" was torn down in 1933 (see it in Appendix C) and was replaced by the large two‑story cabin, used by Frieda and Ravagli, which later became the caretaker's home and office. It is the most prominent feature one sees upon arrival and stands closest to the parking area. Frieda recorded the building costs for the original portion at under $2,500 (Squires and Talbot, 375). A special room for displaying Lawrence's paintings and a garage were added by Ravagli circa 1937. This cabin now measures roughly 50 x 25 feet, containing a brick chimney centered on the north side, a centered porch on the south side, and shuttered windows. It is mostly in keeping with the materials and style of design for the other log cabins, having only a few visible details that betray its more modern construction, such as composite‑asphalt shingle roofing and a solar panel on the southwest side, which doesn't show from the vantage point of the other buildings. The caretaker's dwelling is surrounded by a combination of chain‑link, wire, and white picket fencing. Because of modifications to this occupied cabin resulting in a loss of historical integrity and because of the fact that this building wasn't part of the original grouping and, therefore, doesn't relate strongly to Frieda's life with Lawrence, it is designated a non‑contributing building within the district. The front of the cabin has two entrances: one opening into the west room (which was used as Lawrence's bedroom) and the other opening into the east room (which was used as the kitchen/dining area). (See Appendix E.) The middle "sitting room," containing a large 24‑pane double‑hung window (6 1/2 x 4 feet) and looking out over the alfalfa field with a view of the majestic mountains and desert, was also used as Frieda's bedroom. The two covered porches extending from the doorways were both constructed by Lawrence in 1924. (See the kitchen porch in Appendix F .) The southeast kitchen porch (measuring 8 x 9 feet) was built first in late June, and the supports were made from the trunks of small pines (approximately 4 inches in diameter). Brett describes how she helped Lawrence fell the trees, strip the limbs and bark, and drag the poles back to the cabin. The Lawrences then used this porch to eat their meals on hot days. The tree‑posts are clustered together on the west side to form a shade‑screen against the afternoon sun. Two months after the construction of this first porch, Geronimo helped Lawrence to build the second one over his bedroom door (measuring 6 x 12 feet). On this porch now sits Lawrence's big wooden arm chair with decorative carving.1 The house doors and 1 x 4‑inch trim‑work are painted the fresh white and turquoise color‑scheme selected by Lawrence and Frieda. Lawrence associated the color turquoise with the dynamic blue horse of Taos Indian legends. Lawrence also had been studying the ancient Aztec culture in which sacred turquoise was related to fire and the sun god. The attractive southwest door has four panels‑‑the bottom two of wood and the top two of arched glass. Painted on the exterior west wall of the cabin (and to the left of a 12‑pane window) is a buffalo mural by the Taos Pueblo artist Trinidad Archuleta, created in 1934. The bison is often regarded as a symbol of prosperity and plenty to North American Indians: in fact, to the Taos Indians, "the buffalo was a tranquil giant, loved and not feared" (Collier, in Nehls 2:198). Trinidad was a nephew of Tony Lujan (as he spelled his name) and had lived and worked closely with the Lawrences, helping out with the ranch chores and acting as trail guide. According to UNM, Trinidad came back and redid the mural in the 1950s; and plans are currently underway by the Phoenix Rising Society to have the faded brown and black image restored by Trinidad's relative, Richard Archuleta of Taos Pueblo. Around 1937 Frieda Lawrence directed Ravagli to construct a log addition (measuring 18 x 12 feet) built onto the back at the northwest corner and extending to the fireplace near the midway point of the cabin. (See Appendix G for a historical photograph from this period.) This extension contains a more modern kitchen (with electric appliances) and bathroom. The alteration was made on behalf of her good friend Maria Huxley who, according to Richard Aldington, "refused to live without a bath" (Squires & Talbot, 399). The kitchen is illuminated by a single bare‑bulb ceiling fixture, two six‑pane windows, and one 16‑pane window. An old photograph reveals that the cabin's rear originally had only a single six‑pane window, and this was possibly salvaged and reused on the addition. The remodeling resulted in transforming the original primitive kitchen into a bedroom and Lawrence's former bedroom into the dining area. The roof of the addition is lower with a shallow slant coming off the high‑pitched roof of the original portion. In the 1950s UNM built a small concrete‑block utility area that wraps around the chimney base and houses the water heater. None of the rear is covered with plaster. A portion of the original north‑side picket fence remains intact a few feet away. Entry into the attic crawl‑space is on the cabin's east side. Brett recalls Lawrence cleaning out the accumulated attic debris: "It is like an oven between the roof and the tin ceiling. With a handkerchief bound round your mouth, you have been sweeping the rat‑dirt and nests out with a small dust‑pan and brush. You come crawling out, looking white and tired" (Brett, 71‑72). This east end originally had a narrow, slant‑roofed tool‑shed which has been removed. The front of the cabin, however, looks the same as when occupied by Lawrence and Frieda. She also documents how Lawrence made the two cement seats to either side of the fireplace out of large flat stones. Lawrence always enjoyed a good fire and would later write in one of his poems, “Fire is dearer to us than love or food,/ hot, hurrying, yet it burns if you touch it” (Complete Poems, 505). This room now displays Lawrence's denim shirt and hat, his leather suitcase with luggage tag intact, his old typewriter (used mostly by Brett), and a plate‑metal phoenix (fashioned by Lawrence and Brett). The east room has, in addition to the north window, a three‑over‑three‑pane window on the south side and to the east of the door. Overall, this basic pioneer cabin is made distinctive through the enhancements and personalized touches of the D.H. Lawrences. The fragile oven fell into ruins over time with only a small mound of clay marking the spot. The caretaker rebuilt a similar horno on the opposite side of the cabin circa 1960 (one reportedly used by Frieda and Ravagli), but it also has collapsed and crumbled away. The “Lawrence Tree” towers over the Homesteader's Cabin and stands approximately 25 feet from the east door. Lawrence used to sit under it to write by long‑hand in his notebooks. A simple wooden carpenter's bench (recently stolen in the summer of 2000) rested beneath and was used by Georgia O'Keeffe to get the vantage point for her painting The Lawrence Tree (Appendix I). She lay back on it with her head toward the massive trunk (15‑foot circumference) to view up into the branches. Lawrence claimed that this assertive pine watched over the ranch with a bristling guardian spirit. He writes in his essay, "Pan in America": "The tree has its own aura of life. And in winter the snow slips off it, and in June it sprinkles down its little catkin‑like pollen‑tips, and it hisses in the wind, and it makes a silence within a silence. It is a great tree, under which the house is built" (New Mexico, 40). Brett's painting Lawrence and His Three Fates (Appendix J) pictures Lawrence in typical writing posture, sitting on the ground with his back against the trunk of this evergreen and a notebook balanced on his knees. Lawrence kept the field green during the dry summer months by redirecting the small stream of water across it. Brett writes: "You love the irrigating; you love leading the water over the field, letting it run over your feet. It acts like a kind of drug to your nerves. The water is sacred to you, as it is to the Indians" (Brett, 260). The expansive scene down past the field is of desert plains bordered by jagged mountain peaks. Lawrence compared the view to a “great fawn-coloured” beach from which “bluish hummocks of mountains” rose “like wet rock from a vast strand . . . and beyond, in the farthest distance, pale blue crests of mountains looking over the horizon, from the west, as if peering in from another world altogether (St. Mawr, 145). Brett's tiny one‑room cabin is approximately 45 feet northwest of the Homesteader's Cabin and also faces south. It is a single‑pen log and mud plaster cabin measuring 9 x 11 feet, similar in construction to the Homesteader's Cabin. It has two 4‑pane casement windows‑‑one on the south side to the east of the door and one on the east side equidistant from the corner. Because the cabin was built on a slope, the east window sits only 8 inches off the ground. The gabled roof is covered by wood shake shingles in need of minor repair. A ten‑inch overhang extending on all sides has a rain gutter attached underneath on the back of the cabin. The exterior was originally covered in adobe plaster to match the Homesteader's Cabin, but much of it has cracked away over the years. In a letter dated May 30, 1925, Lawrence tells how Trinidad's wife, Rufina, and her sister were busy "'dobeying the houses‑‑plastering them outside with a sort of golden‑brown mud‑‑they look pretty. It is done every spring" (Letters 5:259). Upon entering Brett's Cabin, the floor steps up eight inches and is constructed also of 1 x 4‑inch planks painted light gray. The white plaster walls contrast with the natural unfinished roof. To the west and behind the 4‑panel door is a small cast‑iron wood‑burning stove vented through the roof. Next to it is a round table and chair from which Brett slowly typed Lawrence's manuscripts, a few pages at a time. There is barely room for the single bed situated along the east wall. According to the caretaker, all the furnishings are original to the time of Brett's occupation. Brett chose this cozy cabin over the two‑room guest cabin which she felt was too gloomy under the trees. She told Lawrence, "It's quite big enough, really, and I like the sunlight"‑‑to which Lawrence replied, "All right. . . . I will have a new roof put on it, and with a stove you ought to be all right" (Brett, 69‑70). The outbuildings consist of two log barns and a covered cow‑shed and horse corral. The larger barn (measuring 32 x 18 feet) sits approximately 10 feet southwest of Brett's Cabin (see Appendix L) and 15 feet northwest of the Homesteader's Cabin. It has no windows and faces west. The east end has an opening which previously had an exterior ladder leading up to what was probably a hay loft. The smaller barn, used by the Lawrences as a chicken coop, lies to the northwest of Brett's Cabin at the head of the path to the Lawrence Memorial. Lawrence tells of Frieda "going round and round the fowl‑barn, trying to drive in the four new Rhode‑Island‑Red hens, which refused to go to roost" (Letters 5:263). The original portion of this building measures roughly 11 x 13 feet and faces south with a six‑pane window over the entry. Both barns have solid wood plank doors and rolled gable roofs. The smaller barn was added onto in the 1930s by Ravagli, using the scrap wood from the dismantled guest cabin. The west‑side addition (measuring 24 x 25 feet) has a flat lean‑to roof rising to eight feet where it joins the other roof. Later (circa 1950s) public bathroom facilities were installed in the small barn by order of UNM's Board of Regents. The remnants of the corral and shed lie in a small clearing approximately 100 feet to the northwest of the chicken coop. The corral measures 42 x 56 feet together with its northside covered stable, divided into four stalls (14 feet deep). The three westward stalls are open, and the east‑end stall is an enclosed tack area. This corral shelter has a log frame with 2 x 6‑inch timber rafters and walls of wood plank and corrugated metal. At the outside of the northeast corner, a handmade wooden chair hangs by a nail on the rear wall. The open corral space contains a small fenced kennel and a horse trough made from a cast‑iron cylinder cut in half lengthwise. The double metal corral gate is on the southeast corner. In the past the corral was used for goats by the McClures. Here the Lawrences kept horses (see Appendixes M and N). The cowshed didn't keep the cow from wandering off, however. Frieda recounts: "Lawrence got up at five o'clock each morning. With the opera glasses my mother had given him, he looked for Susan, who was an independent creature and loved to hide in the woods" (Frieda Lawrence, "Not I, But the Wind...,"145). Further north and at a point about 300 feet along a shady trail is the spring that supplied the Lawrences with a trickle of fresh water from a pipe that filled a tub underneath. Frieda describes it in her memoirs: "The spring is in a hollow, and I loved watching the horses play when they came to drink there, shoving each other's noses away from the water level and then tearing up the bank" (Frieda Lawrence, "Not I, But the Wind...," 145). Lawrence, Frieda, and Brett all labored together cleaning out the spring, fitting a new pipe, and lining the surrounding pool with rocks. But the spring tended to dry up by summer, so in May of 1925 Lawrence had water pipes installed by Scott Murray and a team, including Trinidad, to bring water from Gallina Canyon (about 2 miles distant). Frieda tells of the difficulty in laying the “big pipes on pillars of wood to bring the water along,” noting how often “the pipes had to be fixed, after a cloudburst had broken the whole thing down” (“Not I, But the Wind. ..,” 41). Lack of water continues to be a problem at the ranch. In the early 1950s, the caretaker brought up a 400‑gallon water tank and pump (not visible from the cabins) to supplement the water supply. The Lawrence Memorial (built by Angelo Ravagli in 1934) lies to the northeast of the other buildings at the end of a rock‑lined path that winds its way up the steep incline. The walkway was cemented in 1988 by the caretaker to allow for handicap access to the memorial. It starts at the base of the hill to the east of the chicken coop and extends straight for 85 feet before starting its zigzagged, eastward ascent 255 feet through the corridor of pines. 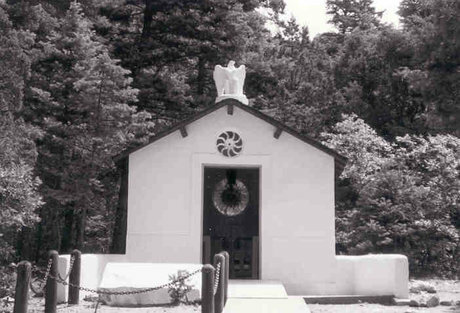 The white plastered chapel‑like memorial building sits nestled at the hilltop, measuring 12 x 15 feet with a gabled roof of handcut cedar shake shingles. Perched on the roof peak is a two‑foot sculpture of a phoenix, Lawrence's personal symbol that was frequently stamped on the front of his books. Directly underneath this mythical bird and over the double doors is a rosette window made from an agricultural wheel. Two half‑walls of stucco‑covered cinderblock extend out and to either side of the building front like welcoming arms. The Lawrence Memorial itself is constructed of wood, cement and adobe bricks. The interior was finished with bubble‑textured plaster painted yellow and has a 9 1/2‑foot‑high cathedral ceiling with exposed joists painted silver and blue. To the left, on the north wall, is mounted a framed copy of Lawrence's cremation documents issued in Marseilles, France, and a guestbook registry. Old guestbooks are stored by the caretaker. The altar block is centered on the back wall enclosed behind an openwork concrete partition with wood‑carved gate, 46 inches in height. A Spanish style iron‑filigree chandelier hangs from the ceiling, and another rosette window (30 inches in diameter) painted as a sunflower lights up the altar from above. Frieda maintained that Lawrence's ashes were mixed into the cement of the heavy altar to prevent their theft. This rectangular cement block (measuring 43 x 20 inches and 22 inches high) features Lawrence's initials on the front and is decorated with leaves and sunflowers. It is topped by an altar niche containing a statuette of a phoenix, appropriately rising from the funeral ashes. Old photographs reveal that at one time this niche held a sculpture of a fox, another of Lawrence's symbols (Appendix P), bringing to mind how the Taos Indians used to call him the "Red Fox" because of his red beard.2 This statue (created by Gladys Caldwell Fisher of Taos) was removed by Ravagli and taken back to Europe with him after Frieda's death in 1956,3 then subsequently replaced with another phoenix. Slender wooden candlesticks grace both sides of the altar. Dorothy Brett is known to have contributed to the interior decor of the memorial shrine, including the window over the altar. Facing west, the memorial site offers an especially fine view at sunset. This choice spot is near the ranch's high‑point and was where, "in past summer nights," Lawrence and Frieda "had slept out of doors under the pines" (Memoirs and Correspondence, 133). Frieda likened the quaint building to the temple of Isis which "faced the splendid sun of winter" in Lawrence's story, The Man Who Died (41). A line from the story's Lawrentian character reads, "I saw the temple like a pale flower on the coast, and would rest among the trees of the precincts, if the lady of the goddess permits'" (52). And Lawrence's spirit does indeed seem to rest peacefully here at the pale temple among the dark pines. Frieda claimed in her memoirs: "How he loved every minute of life at the ranch. The morning, the squirrels, every flower that came in its turn, the big trees, chopping the wood, the chickens, making bread, all our hard work." She added, "He worked hard as a relaxation and wrote for hard work" ("Not I, But the Wind...," 153). The historic integrity of the Lawrence Ranch District is retained by all of these historic characteristics and associations.